The Koolhaas show is in full swing: one pseudo-event after another is launched from Berlin these days and sent spinning around the world. One recent publication was supposed to explain Koolhaas to those outside the circle of initiates. It doesn’t. Allard Jolles about the media-uproar and the book. The new Dutch Embassy in Berlin has already been dubbed ‘The Revenge of Koolhaas’. More than ten years ago, Koolhaas stormed out of the jury assembled to decide the future of Potsdamerplatz. In Welt am Sonntag he recently recalled that ‘dramatic moment’ a ‘real conflict’. But the drama had a happy ending, it now turns out. The embassy is completed, a major exhibition opened at the Neue Nationalgalerie, the Berlin Architecture Prize is his, and a pile of new books is hitting the bookstores. What’s remarkable is that these books aren’t by Koolhaas but about him, his office and his designs. And that’s not all. The world’s media are churning out countless articles and TV reports, not only about the building, exhibition and books but also about the mysterious Koolhaas himself. Koolhaas’s ‘revenge’ is about more than a building and a few marginal phenomena of course. It bears all the hallmarks of a well-orchestrated media offensive backed up by a merchandising campaign (a collection of T-shirts accompanies the exhibition). In the same interview in Welt am Sonntag, on the subject of Prada, Koolhaas tells how fashions fascinates him. What fascinates him in particular is the speed at which the latest fashion spreads around the globe and the efficiency with which top brands design and produce goods. (Rhetoric: as though lesser brands don’t function efficiently). Koolhaas himself became a brand long ago and, as such, is subject to the fashion’s fluctuations, as recent events in Berlin illustrate. Openings and award ceremonies are pseudo-events in the true sense of the word. They are staged with the sole purpose of making headlines or being reported in other ways. And that’s been a huge success. The aim of these events could be anything, but generating publicity for the exhibition certainly is not their underlying purpose. And they’re always self-fulfilling prophecies. Koolhaas is a good architect, so he’s awarded a prize, and then that he’s good because he won a prize. Everyone’s a winner. The Berlin Architecture Prize gains in prestige with Koolhaas as laureate. The people at OMA – or is this the work of AMO, the companion think-tank? – have passed their communications test with flying colours. They’re justifiably ‘content’. 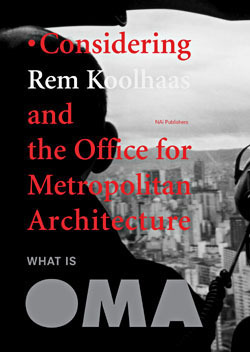 And then the first book to appear amidst all this activity: Considering Rem Koolhaas and the Office for Metropolitan Architecture. What is OMA. The purpose of the book, the jacket blurb tell us, is to clarify Koolhaas for the average culture buff who, according to the publisher’s catalogue, has ‘only two criteria when looking at architecture: it has to look good and it has to serve a purpose’. What a shamelessly arrogant statement, and untrue as well. Professionals always consider beauty and function, and other disciplines come into play later. Explaining Koolhaas to the uninitiated should, I think, begin with a redefinition of ‘beauty’ and ‘function’. And in the case of Koolhaas that’s possible, for he’s the one architect who’s forever working to reprogram space and function. Alas, more than half the essays in the book fail to explain Koolhaas, OMA or AMO in any understandable way. In some of the essays OMA and Koolhaas even vanish from view entirely. In truly wafer-thin theoretical prattle entitled ‘C<amo>uflage’ – a real gem, this typographical jeu de mots – Neil Leach explains that the concept of ‘camouflage’ highlights the significance of design in contemporary society. It’s a design concept that allows people to relate to their environment. What utter nonsense. Even worse is Okwui Enwezor’s essay ‘Terminal Modernity: Rem Koolhaas’s Discourse on Entropy’. The very first paragraph is titled ‘Tabula Rasa: A Theory of Everything, Apropos the City’. And if I tell you that the writer takes Freud seriously, you’ll understand that the essay might better have been titled ‘Tabula Rascal’. I can scarcely imagine that Koolhaas enjoys seeing texts of this sort published, even though they do sustain the myth that surrounds him. In Weit am Sonntag he admits that one of the worst things about his stardom is that his every utterance is turned into theory. Sure enough, that must get pretty frustrating, though Koolhaas has no right to speak. After all, anyone who gets involved with branding and fashion and with staging major pseudo-events has little option. Frustrating side effects just come with the job. Finally we have author Ian Buruma. What is OMA includes his 1996 review of S,M,L,XL. No harm in that, since this is a good piece of writing. But then: in a footnote Buruma says how he admires Koolhaas in a political sense for his refusal to take on projects in China (El Croquis 79 / 1996). Suddenly I was awake. Didn’t Buruma write something totally different on the matter a while back? And isn’t Koolhaas currently working in Beijing? True on both counts. In The Guardian of July 30, 2002, Buruma counters all arguments put forward by Koolhaas to justify his working there now, including the argument that opposition is nothing more than a vestige of misplaced imperialist arrogance. In Beijing Koolhaas is designing the head office for the Chinese propaganda apparatus, the state television broadcaster. And propaganda is not the same as freedom of expression and democracy. It’s a pity the book’s compilers weren’t a bit more up to date on this issue. What’s more, the constant references to the 25-year-old book Delirious New York start to get tedious after a while, all the more so since Koolhaas recently wrote an essay entitled ‘Delirious No More’. Nowhere does the new book refer to this recent essay, or to its relation to the book from 1978. That is strange, and also disappointing. After reading 180 pages we know little more than we did at the outset. And the uninitiated? They’re better off buying Delirious New York or the autobiographical novel S,M,L,XL. Better still, if you want to show you’re really with it, buy an exhibition T-shirt. At least it looks good and serves a purpose. On pseudo-events: Daniel J. Boorstin: The Image (1961) Chapter 1 of this book is publish here in full. The article by “Don’t be fooled – China is not squeaky clean’ in The Guardian.